It’s a promising musical start to 2019 when two of the best albums so far are from Norwegian heavyweights Motorpsycho and Spidergawd. While Bent Sæther was once in both bands, Orango’s Hallvard Gaardløs took over bass duties three years ago. Motorpsycho has covered a lot of ground in their 30 year career, from expansive indie noise rock to psych pop and prog to orchestral collaborations, jazz fusion and even country. 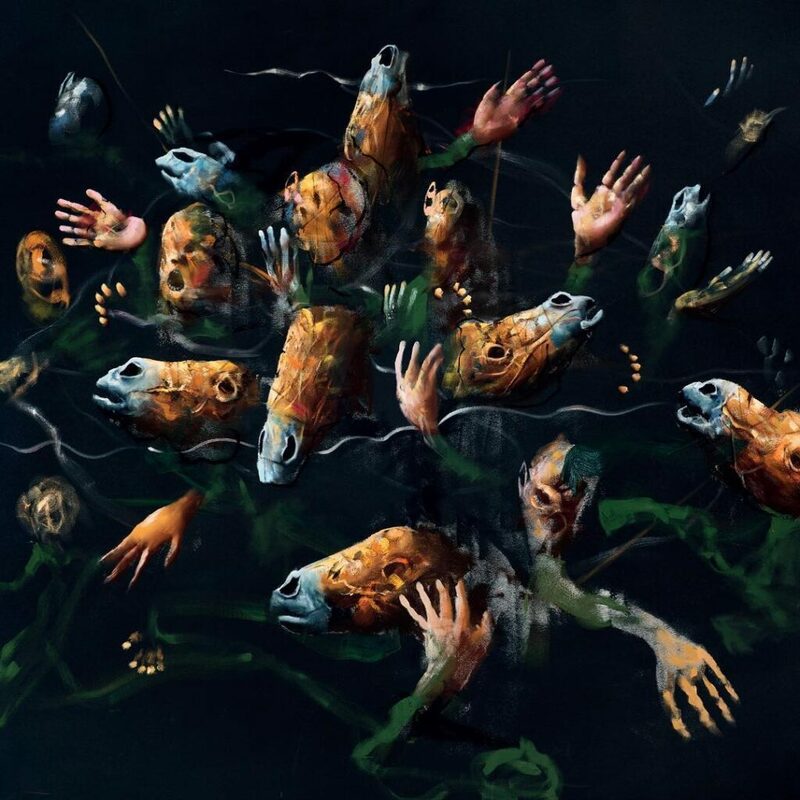 Spidergawd is no small potatoes side project, however, but rather a a fully evolved hard rock band on their fifth album, and has stared imperiously down at its competition since V‘s release on Jan 11. While the bands cover pretty different areas of rock, Spidergawd does sometimes veer over to Motorpsycho’s territory with Rolf Martin Snustad’s baritone sax adding a touch of jazzy prog. These albums show both bands in absolutely top form. Together they rule the rock of Himinbjorg. Motorpsycho have the formidable task of following up their double album The Tower (2017), arguably the best of their huge catalog. While it’s not intended as a sequel, there’s a clear connection between The Crucible and The Tower in using the same artist, Håkon Gullvåg, and essentially the same color palette in his painting “Egypts hær drukner” (The Egyptian army has drowned). The sound is not radically different between the two. The Crucible is slightly heavier and darker, but hardly as radical a departure as their trilogy of psych pop albums in the early 2000s (Let Them Eat Cake, Phanerothyme and It’s A Love Cult) or the symphonic collaboration with Ståle Storløkken. With the exception of that pop excursion and The California EP (2017), Motorpsycho are not known for traditional song arrangements with catchy hooks and melodies. Rather, they construct towering monuments to sound in all its trippy and technical glory. It’s probably why the compilation, Supersonic Scientists: A Young Person’s Guide to Motorpsycho (2015) is far from the best way to experience Motorpsycho. It’s certainly an adequate sampler for those intimidated by their massive discography that could easily fill two entire days (over 48 hours). But the average Psychonaut, as the fans call themselves, tend to be inclined toward full immersion, and are not intimidated by 84 minute albums. That said, their latest is actually a good place for a newcomer to start. At three tracks in 40:30, it’s their most concise, compact album since Child Of The Future (2009), the vinyl-only release recorded with Steve Albini in Chicago. “Psychotzar,” kicks off with a doomy Sabbath style riff, possibly in tribute to “Supertzar” from Sabotage (1975), and at 8:43, is relatively concise for them, fitting in a killer guitar solo amidst the cyclical riffing. “Lux Aeterna” gets a bit more epic, starting with acoustic guitars and Yes-style vocal harmonies, building to an early mellotron and woodwind-aided sweeping plateau, then morphing midway into a jazz noise freakout, eventually circling back to the calmer acoustic waters of the intro. This leads to the main event, the massive 20:51 long title track. Here they show off their jazz prog chops in the first 4:30, establish some simmering dramatic tension with vocals and atmospheric washes of guitars and Mellotron. After reaching a crescendo, the track gets quiet as it eases gently into its third movement, then explodes into some energetic, complex interplay that brings to mind 1977-78 era Rush. It returns to the lyrical themes of the second movement. 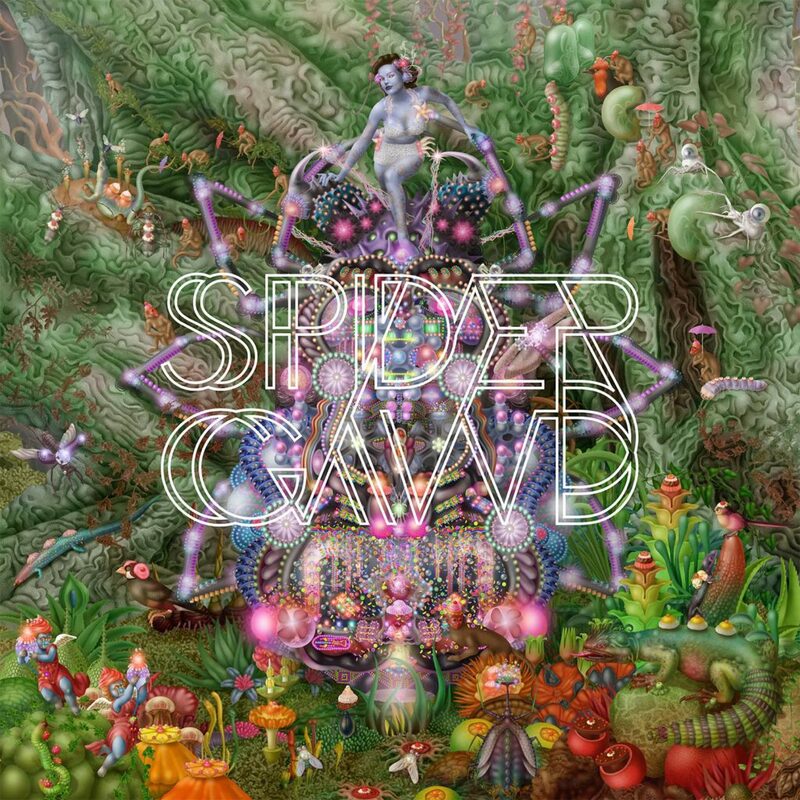 On the other hand, the fact that Spidergawd’s music isn’t just caveman boogie rock and blunt Viking force may be what sets them apart from the standard hard rock bands of late. They do embrace a gauzy, spacey psychedelia that’s just as suggestive of a more feminine energy as the amorphous faerie creatures and lush settings in the art of French artist Emile Morel which graces all five of their albums. The imagery is as suggestive of depth and power as the band’s subtle sound colorations. V (their fifth album in six years) starts with a dramatic flourish, Rolf Martin Snustad blowing his sax for over a half a minute unaccompanied as if this was a spiritual avant jazz track by Pharoah Sanders. Drums join in then guitar and just over a minute into “All And Everything” they’re in full flight mode, with Kenneth Kapstad (who also served with Motorpsycho 2007-16) inserting drum fills like Iron Maiden’s Nicko McBrain. Spidergawd know how to open an album as well as I imagine they come out storming on live shows (come over to North America guys, we won’t bite). Per Borten, formerly of Cadillac, used to remind me of Monster Magnet’s Dave Wyndorf. There’s definitely a similarity in timbre and style, but less so on the last couple albums, as Borten is gradually adding additional shades to his vocal palate. He masters soaring melodicism on “Whirlwind Radio” and a simultaneous frantic and fragile desperation on “Green Eyes.” On “Ritual Supernatural” he shows control and subtlety that easily measures up to the pro singers in any number of polished AOR supergroups of decades past. Even if you don’t care for that kind of slick sound, it’s an important factor that often divides underground stoner rock bands and more polished hard rock bands that have more commercial success. Spidergawd certainly have the chops to hang with the big dogs and command a headlining festival spot. I’ve been listening to this album nearly every day for over a month, and it just goes from strength to strength. While all their albums are impressively consistent, this one could definitely hold it’s own next to the best songs cherry picked from the first four. The album wraps up with a storming evocation of the best bits of NWOBHM on “Do I Need A Doctor…?” leaving nothing but rubble, broken glass and receding middle fingers in their wake. Do they teach rock in the Norwegian school system? Seriously, I’m asking for a friend. This entry was posted in New Album(s) of the Week, Reviews, Videos/Singles and tagged hard rock, Motorpsycho, psych prog, Spidergawd, The Crucible. Bookmark the permalink.